The bill was denied passage due to billions included for projects that had nothing to do with Hurricane Sandy relief. For instance, $150 million was included for fisheries in the Gulf Coast, New England and Alaska that were affected by the Japan earthquake of March 2011. Also found among the billions in pork, was $2 million intended for Smithsonian museum roofs in Washington. Yet those unrelated projects pale in comparison to the $28 billion that was earmarked for future disaster-mitigation projects. According to Taxpayers for Common Sense, only three states (Arizona, Michigan and South Carolina) were excluded from receiving Sandy relief money despite the fact that most of the US was not affected. In response to the justified criticism, Congress quickly approved a $9.7 billion aid package in the first session of the 113th Congress that excluded the large amount of unnecessary spending. Now the House is set to vote on an additional $50.7 billion Sandy aid package that hopes to fund the pork projects that were removed. In their attempts to pass the new (unfunded) spending, lawmakers have pointed to the quickness with which disaster relief funding was passed for Hurricane Katrina; but, of course, they fail to mention the details as to why Katrina aid was so immediate. In 2005, when the first Katrina disaster relief bill was passed, Congress suspended the normal rules and procedures to hastily pass the measure before it was loaded up with pork. They then followed up with numerous bills to pay for their pet projects all under the name "Katrina." Federal officials also spent more than $15 million worth of all sorts of unrelated goodies for themselves, according to Taxpayers for Common Sense. Millions of tax dollars went toward costly, new, top-of-the-line laptops for other agencies, as well as handheld devices, sporting goods and even steak knives for government bureaucrats shaped like scimitars. Even the U.S. Army Corps of Engineers got a new $15 million museum, despite the fact that this is the agency that designed and built the levees that failed and submerged New Orleans beneath a devastating flood. A Republican Study Committee audit discovered that millions went for "peace" and "diversity" workshops, a "yearlong celebration of trees, gardens and other healing places," theater workshops, anger-management classes and multiculturalism programs to discuss "who we are and why we are here." Evacuees got a free massage or acupuncture treatment. Group counseling sessions and medical checkups were also available, as well as yoga class in the morning and live music—roving mariachi bands, rock ’n’ roll acts, singers with acoustic guitars—at night. Over seven years later aid for Katrina is still being distributed, although for what expenses exactly is a frightful thought. Considering the complete failure of fiscal responsibility in the aftermath of Katrina, the Republican method of proceeding with caution in approving aid for Sandy should be celebrated. Yet while members of Congress who seem to have learned from the past are being demonized, Democrats are begging the President to bypass Republicans to borrow more money. 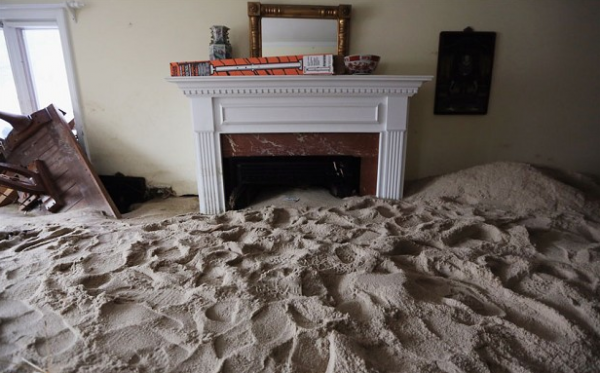 While Democrats and Republicans seek to paint a continued dire situation for those recovering from Sandy, according to Scott Garrett (R-NJ), "the people from the area have not been waiting. Their insurance claims have been paid from day one. We are just here today to ensure that those payments continue, going forward." The Senate has already proven that Katrina taught them nothing and that dealing with the deficit is just a talking point. Now it is up to the House to take the first step towards ending the reckless spending to which Congress has become addicted. I understand sending money to one of the poorest places in the country that was devastated by the failure of Federal levies. But why do we have to send money to one of the richest places in the country that chose not to prepare for bad weather? @Don Gibson . I am inclined to agree with your question . Even though N.Y. and N.J. are in a financial bind , they are the first in line for offering help to their respective citizens . They should only be relying on the government after they have done everything possible themselves . I'm sure that they could make some cuts in their bloated budgets if they so desired .